You have to look VERY closely at this picture to be able to pick anything out, but this so resembles my life as of now. This is the view from my window, looking down to the lot below. On the very left is the TV and crowded all around it are little heads of Sudanese men, watching. 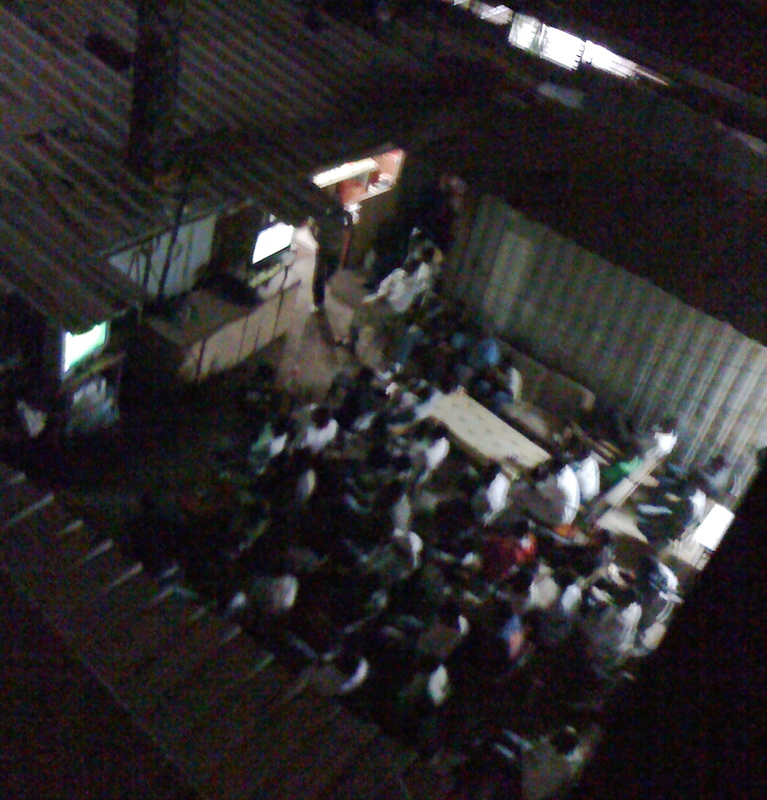 It is actually a Sudanese bar, and anytime there is a futbol (soccer) game on, they all gather and watch it. Its soooo African style: old couches, chairs, and tables, and junk all around, but no one caring at all. They blast the TV, and if I stand at the window I can see/hear play by play. Its comical is what it is. I apologize for the quality of the picture, but its a last minute IPhone pic. (and its very dark) hehehehe. If you haven’t heard yet, I’ve started learning Arabic this past week. I am now able to write all the letters (all millions of them) and we are starting to form words and sentences now. I honestly thought Hebrew was difficult, but it seems to be a piece of cake compared to this crazy language. The beauty of it though, is that they have many similarities, and knowing Hebrew first has helped me tremendously. Anyways, today at Food Distribution, our little translator came to help out so I was showing her my Arabic workbook and what I was learning. It was then that I discovered she does not know how to read or write in Arabic, only Hebrew. Arabic is her mother tongue… her first language…. the one she speaks with her family; YET, she does not know how to read or write. She reads/writes only Hebrew. And this is true for many of the Sudanese we work with. Therefore, I decided that a part of the after school program at the youth center will be dedicated to teach these kids how to read and write their own language. Imagine a foreign American… teaching written Arabic to kids who speak it fluently… in a country that none of us belong to… in Hebrew. Now if that isn’t just crazy awesome, then I don’t know what is!!! I’m getting anxious with my youth center plans, and I have a feeling I’m not the only one. Though its not official, and most people here don’t have a clue of what I’m about to embark upon, I think the feeling of something new must be brewing in the air. Lately at the Food Distribution more and more kids have been coming, not just to pick up food for their moms, but to stay and chat (and sometimes help out!). Last night we were graced with the presence of our two little “translators”, a term and position they have appointed themselves. Since most of the mothers only speak Arabic, and I only speak Hebrew, they like to be the ones to communicate all the in’s and out’s of the procedures. It’s very cute, actually. They sooooo need this youth center, to have a place to go. I’m getting excited about the vision I have, and this week I will be looking at some potential buildings for the site. In the meantime you can see my adorable, little helpers for yourselves. These girls are two reasons why I am passionate about future plans…..
2:00 is good; it gives us time to sort through the different sizes, organize them into groups, and package them up for when the women come. But this is Israel! 2:30 comes and goes, but he has not arrived. 3:00, still no diapers. The women begin showing up and we tell them he should be coming any minute. 3:30, the natives are getting restless and so are we. 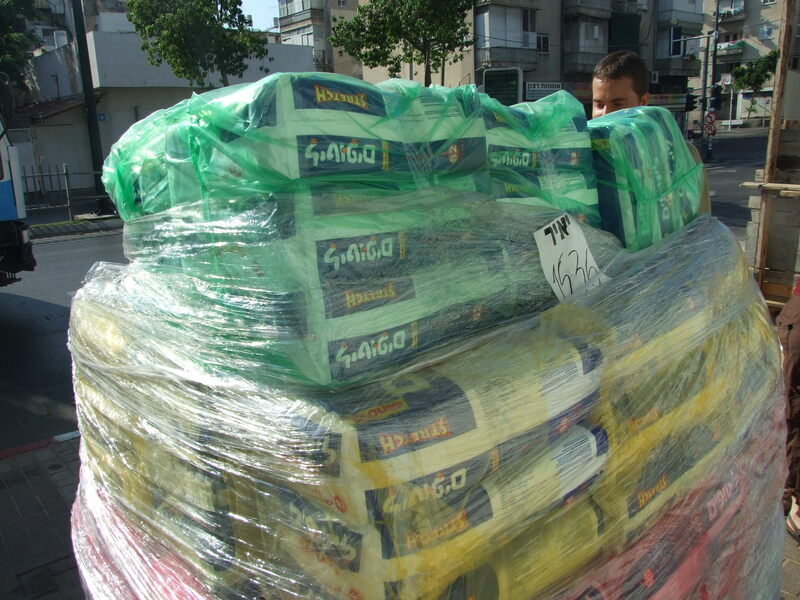 We decided to start making food packets and give them out instead, since it doesn’t look like he’s coming again. So, we ATTEMPT to sort them as best as we can and begin giving them out. It was a huge mess… diapers everywhere, women wanting food + diapers, me trying to remain calm and record their numbers at the same time, and sweating profusely from the heat and small quarters. Finally at 6:00 we were able to stop for the day. I was exhausted (to say the least), dirty, thirsty, and… delirious from all the diapers!! Does anyone have/know of a WII system and games that can be donated 4 a new youth ministry in Israel? This would be a HUGE blessing!!! I hadn’t gotten any replies, and I honestly just put it out there in the social media world, “just in case”. It was from a friend I had graduated with, and quite honestly, had not seen since graduation day back in 1993. (Yep, a looooooooooong time ago.) He told me he didn’t have a WII to give, but he would like to start a fundraiser in order to purchase one. Not only start a fundraiser, but spread the word, buy the complete set (with as many games as possible) AND ship it to me. My mind was completely blown by that email! Here was someone who I haven’t even seen or really spoken to in 15 or so years…yet he was willing to put all this time and effort into pouring out for kids he has never even seen or met. He was willing to go the extra mile, all for a cause I believe in. Like I said, sometimes I’m left speechless. I have been writing about my work with the Sudanese Refugees, and the problems they have been encountering with the government. (I also mentioned it in last month’s newsletter as a prayer request.) Their status in TA has been big news the past few weeks here as well, even making it to the front page of The Jerusalem Post. A couple days before the Aug. 1st deadline of deporting them out of TA, the Israeli government made a statement, postponing the deportation until a further date. There had been an outcry among the people here on their behalf, especially regarding the children who were born in Israel, therefore becoming Israeli citizens. I was actually surprised to see such an outpouring of support for the Sudanese, when there has been such mumbling about them even being here. That being said, this was only a temporary decision, and the future of the Sudanese in TA is yet to be seen; but, I know for all the families we work with, they are extremely relieved and happy. 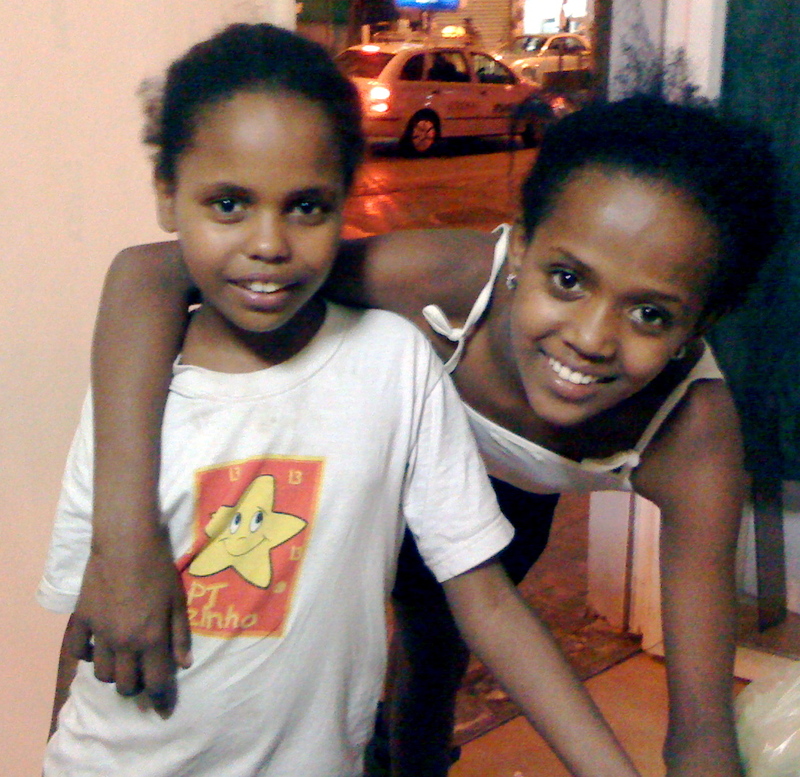 They can once again walk the streets without fear of being picked up and imprisoned or sent to another city (for now).